This camisole or corset cover pattern is based on an original period pattern from the 1910s. 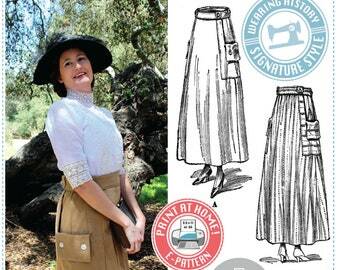 It is equally lovely when worn for period costume or worn as a modern casual top! The front and back are cut loosely and the front retains a bit of the “drooped” front which was popular in the early 1900s. This camisole adjusts at the neckline by running ribbon through lace beading and tying it to your preference. The waist is permanently attached to an interior waist stay, and then accented with lace beading. This camisole or corset cover can be made sleeveless or with short, gathered sleeves attached to a cuff. It can end at the waist, or be made with a peplum. For intermediate difficulty, this pattern has the period original, written sewing instructions which are very minimal and text only. It is also highly suggested you have a good grasp of pattern fitting and alteration, as fit is unchanged from the original period source material, and it may need to be adapted for modern bodies. I have made a video that can help with the waist stay, which is the most challenging part of construction. You can watch it here. This pattern includes bust sizes 32"-48" in one size packet. . The waist ratio is very different than current standards, but our testers substituted larger waist pieces with no difficulty. If your waist exceeds the size chart, we have included information on where to enlarge the waist and peplum pieces. This pattern is a “Resto-Vival” pattern from the 1910s, which means it was based on original period source material which has been RESTORED and REVIVED. 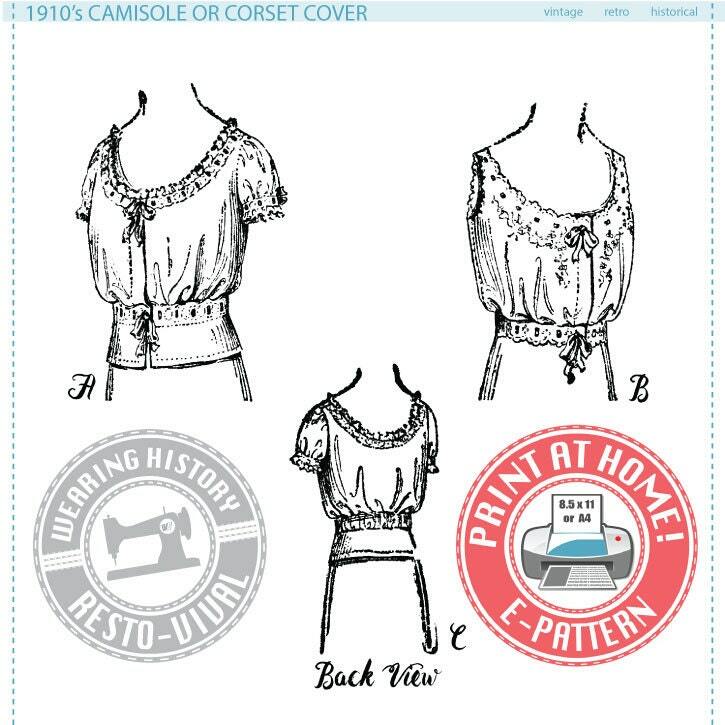 To read more about Wearing History "Resto-Vival" patterns please read the paragraph at the bottom of the page to see what to expect. ~ Original period sewing instructions which were included with this pattern. These are unillustrated and about a paragraph in length. ~ I have composed and compiled written two pages of unillustrated instructions to help you with assembly. ~ A page listing checkpoints to keep an eye on when you fit your pattern (refer to a fit book for instruction on how to alter, as these are not included). ~ Added instruction taken from period 1910s sewing books that can be applied to your construction. ~ This E-pattern includes both files to print in COLOR or in BLACK AND WHITE. You get to pick which one to print! ~ DOES NOT INCLUDE illustrated step by step instructions. They are mostly text only. ~ DOES NOT INCLUDE detailed information on basic technique. You should be familiar with basic construction or have a sewing book handy if you need help on how to hem, gather, and attach basic seams together. ~ DOES NOT INCLUDE cutting charts. You will need to create your own cutting layout on your yardage. ~ DOES NOT HAVE uniform seam allowance. Seam allowance retains the original period standards, so seam allowances vary from 3/8" to 1.5". This was to allow for later alterations at the most frequent alteration spots (such as side seams and shoulder seams). ~ DOES NOT INCLUDE direction for embroidery or embellishment. You are to trim as you desire. If you have an Embroidery Machine, you may purchase the beautiful embroidery patterns designed by Romantic Recollections to go along with this pattern. ~ 1 for the e-pattern "how to" sheet. 34 total sheets of 8.5" x 11" sized paper or A4 sized paper are needed to make all garments in this pattern. This pattern file is formatted to fit on both sizes of paper, and there will be varying thicknesses of white border, which will be cut off, according to pattern instructions. Great pattern that turns out quite well and true to size. Recommended!